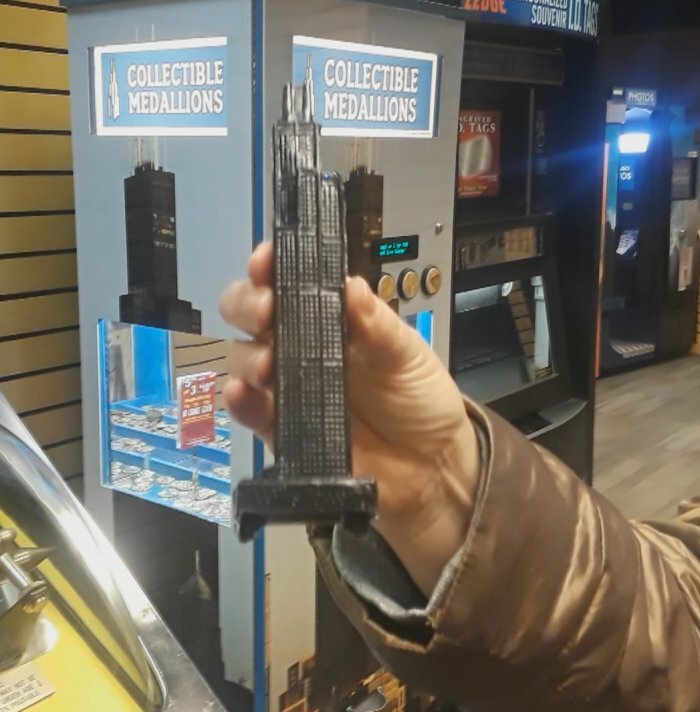 In December, 2018, your PopCulteer and his wife, Mel Larch, visited The Willis Tower in Chicago, one of the tallest buildings in the world, and rather than ascend to the famous SkyDeck, we immediately went to the second-sub-basement for the arcade near the gift shop. 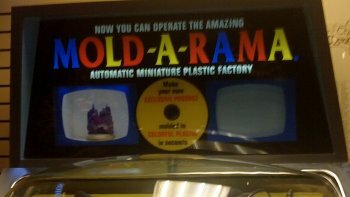 There we beheld two MOLD-A-RAMA machines. This video captures that experience. 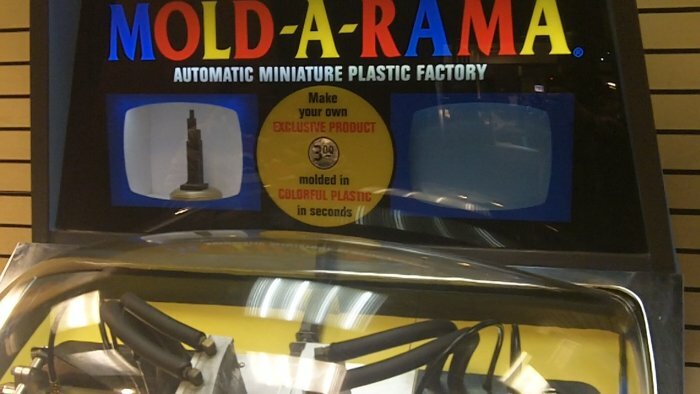 MOLD-A-RAMA machines are huge beasts of post-war engineering, giant vending machines that make and dispense a cool little injection-molded plastic toy while you wait. The machine was introduced in 1962, but really took off at the New York World’s Fair in 1964, and soon spread across the country, thrilling kids with its distinctive smell of freshly-molded waxy plastic. Invented by Tike Miller, this cool novelty inspired the cult-television show, Wonderfalls, and created lasting memories for hundreds of thousands of kids. There are still over a hundred machines operating in eight states, and Chicago is a hotbed of MOLD-A-RAMA activity because the company than currently owns the rights to the machines is based there. A separate company operates the same machines as MOLD-A-MATIC, and those are primarily found in the South. The engineering that goes into these machines is amazing. 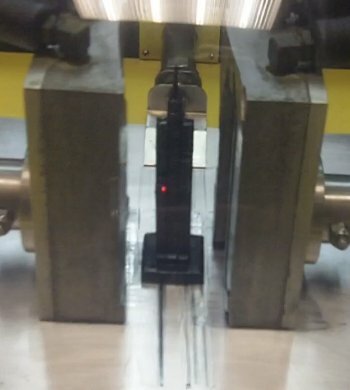 The vat that holds the plastic is heated. The molds are refrigerated. There are hundreds of moving parts, and the temperature of every piece has to be perfect, plus the molds have to fit together tightly. Hot plastic is injected into the molds, where it solidifies instantly. The remaining hot plastic inside is then blown out (which also cools the insides a bit). Then, once the mold halves part, a little knife slices the toy loose from the nozzles, and slides it into the retrieval basket. This is the kind of engineering that got us to the moon. I was inspired to seek out these machines after Tom Wheeler sent me a video link to a story about them, and through that I discovered that MOLD-A-RAMA has machines all over Chicago, a city that PopCult readers know I like to visit regularly. I would be remiss if I didn’t point out that there are a lot of great MOLD-A-RAMA videos on YouTube, particularly by Carpetbagger, who has been covering MOLD-A-RAMA much longer than we have, as well as tons of other cool raodside attractions.. Bigger than a Jukebox, but tens times as cool for toy collectors. 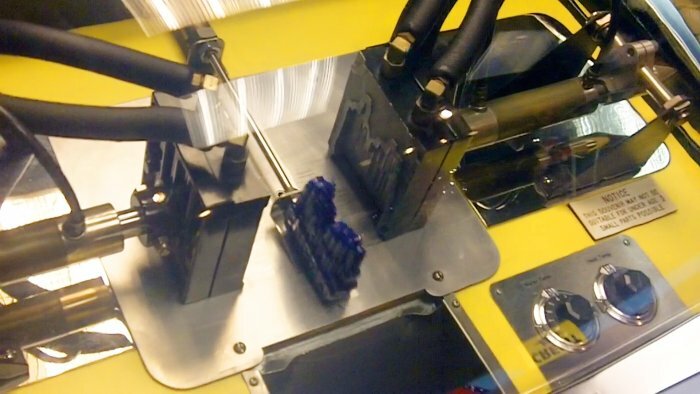 Each machine only holds one mold. 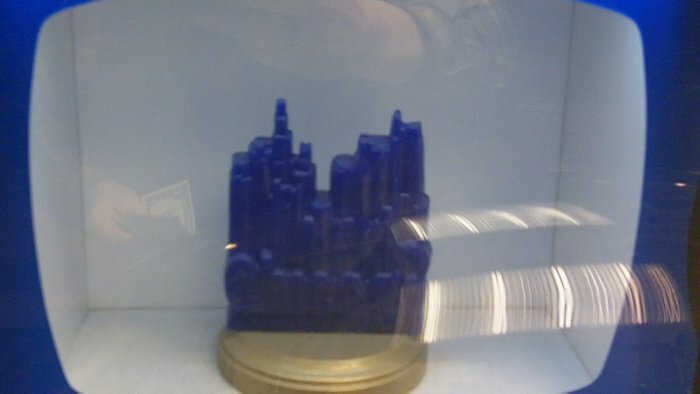 This one has The Chicago Skyline, in royal blue. Post-molding, the blade/pusher slices off the toy and pushes it into the basket. The end result is a nifty plastic souvenir. Glad I was able to inspire you to seek out these cool machines! I remember a couple of them from a fair in Michigan when I was a kid. And thanks for sending me the ones from Chicago! Awesome to know these remarkable machines are still around!